This is annual “contest”, but the fascinating part are the stories about these famous or well loved trees. Hard to believe it has been that long ago [see also camai-start-here] when a new killer emerged among NM and the Pueblos. No one knew at first what it was and how to avoid the mystery illness which seemed to target young Native people. We couldn’t wait for the “outside experts” but needed to rely on the Pueblos’ own experts to begin to combat the disease and rumors. It was frightening. BTW, before an official name sin nombre was assigned, the CDC did receive suggestions and concerns from the Pueblos about the suggested names which inadvertently used Pueblo sacred site names or other names which were used by folks other than CDC researchers. Sin nombre was a good choice. In 1993, an outbreak of severe respiratory illness in the Four Corners region of the United States (defined by the shared borders between the states of New Mexico, Arizona, Colorado, and Utah) made national headlines. The subsequent discovery of a new disease, hantavirus pulmonary syndrome (HPS) (1), its etiologic agent, Sin Nombre virus (SNV) (2), and its rodent reservoir, the deer mouse (Peromyscus maniculatus) (3), were among the most prominent findings in a flood of new revelations about hantaviruses in the Americas. I can’t figure out how to post at both nlogs, so i must direct you to the site. Sorry. 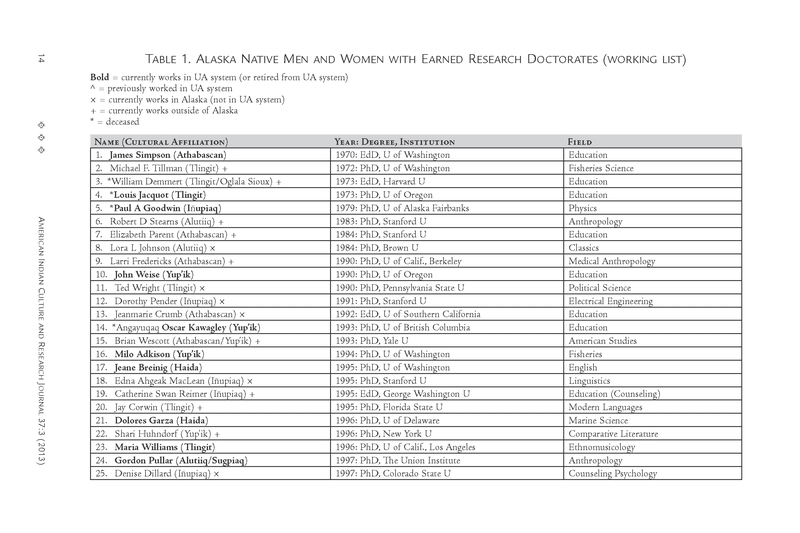 Dr Perea’s paper has a listing of Alaska Native Ph.D.s which complements the existing list previously mentioned American Indian and Alaska Native Ph.D.s in the US– How many? Who are they? Jessica Bissett Perea 2013 “A Tribalography of Alaska Native Presence in Academia.” American Indian Culture and Research Journal 37 (3) pp. 3-27. Invited essay for special issue “Reducing Barriers to Native American Student Success in Higher Education: Challenges and Best Practices,” ed. Robert Keith Collins. Note to FullTextReports followers  Grab It When You See It! 0.93 x e4 ppcc vs. 2.95 x e4 +/- 1.50 x e4 ppcc; p <= 0.001), the incidence of in-commute offensive odour detection (42 vs. 56%; p = 0.019), and the incidence of dust and soot observation (33 vs. 47%; p = 0.038) and nasopharyngeal irritation (31 vs. 41%; p = 0.007). There were no significant differences between LOW and HIGH in the commute distance and duration (12.8 +/- 7.1 vs. 12.0 +/- 6.9 km and 44 +/- 17 vs. 42 +/- 17 min, respectively), or indices of acute airway inflammation. Conclusions: Exposure to PNC (and the incidence of offensive odour and nasopharyngeal irritation) can be significantly lowered when utilising a route of reduced proximity to motorised traffic whilst bicycle commuting (without significantly affecting commute distance or duration), which may bring important benefits for both healthy and susceptible individuals. 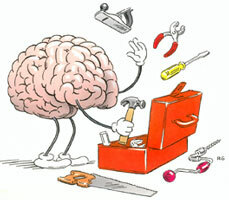 Connotea, nature.com’s social bookmarking site, is closing on March 12th, 2013. We would like to thank you for your patience with and support for the site. This was a very useful resource. I’m not sure there is an alternative. Google Reader no longer allows anyone to share their recommended readings (the Reader here was grandmothered in). I’ll have to figure a way to export the materials collected. American Indian and Alaska Native Ph.D.s in the US– How many? Who are they? Jeannie Greene http://www.jeaniegreene.net/jeanie-greene.html, documentary producer (Heartbeat Alaska) raised an interesting topic— that there were only 45 Natives who hold Ph.D.s in the US. That seems awfully low. Can you help add more names? Below are folks I have found, using AISES and SACNAS. Amazingly, I’m lucky enough to know many of the names and people, some personally. The concert hall at the Syndey Opera House holds 2,700 people. This blog was viewed about 39,000 times in 2011. If it were a concert at Sydney Opera House, it would take about 14 sold-out performances for that many people to see it. Where is the Unorganized Borough jail? This is one of those generic spam sites– cookie cutter spam, I guess. No content just a copy and paste to get someone to stop in. Just as people must share seal meat and oil to maintain physical and social well-being, so, too, must they share knowledge --> that their minds will not rot. To read (and print) only one individual post, click on its title. This shows the comments, also. The comments contain additional or updated information. Search for "revised" to find updated info, too. Unfortunately, Internet Explorer users may find the site doesn't look as nice as Firefox or Opera users, but the info is all here. If people are interested in further developing topics (such as solid waste, environmental health, erosion and climate, cultural ecology and heritage, or alcohol control) just let me know. Dr. April Lea Go Forth on American Indian and Alaska Native Ph.D.s in the US– How many? Who are they? Samantha Chisholm Hatfield on American Indian and Alaska Native Ph.D.s in the US– How many? Who are they? Dr. Frizzell on American Indian and Alaska Native Ph.D.s in the US– How many? Who are they? mpb on American Indian and Alaska Native Ph.D.s in the US– How many? Who are they? 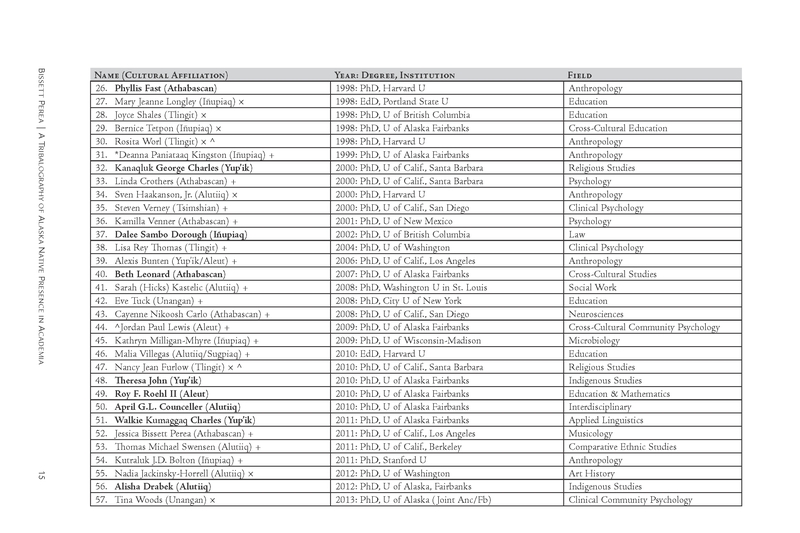 American Indian and Alaska Native Ph.D.s in the US-- How many? Who are they? WASH in health care facilities: Global baseline report 2019. World Health Organization; UNICEF. * The Coming Influenza Pandemic?